India's first Prime Minister, Pandit Jawaharlal Nehru, was born on November 14. After his death in 1963, his birthday has been celebrated as children's Day in India. But why is it called Children's Day? Apart from being known for his skills as a statesman, Nehru was also immensely fond of children. 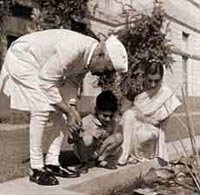 The more popular and famous of Nehru's pictures show him with children. In all the photographs Nehru's joy at being with children is apparent. When he is not sharing pleasantries with them, the expression of intense concentration as he listens to them reveals his commitment and attitude to children. Children to Nehru were little adults in the making. Nehru, to children, is never the Indian political leader and prime minister. He was always known as Chacha Nehru - Nehru Uncle. The story also goes that he started to wear a rose on his jacket after a child pinned one on it. The national children's centre, Jawahar Bal Bhavan, is also named after Jawaharlal Nehru. Children's Day is literally that. It is the day when children all over the country are pampered with goodies. From the schoolchild's point of view, the best thing perhaps is that it is a special day at school - they need not wear uniforms and are given sweets. ***** . WKD : the KIGO CALENDAR .